Legislature Building on St. Thomas. The V.I. 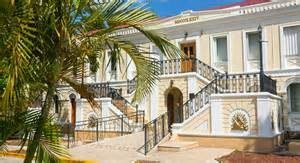 Legislature mandated the Elections Office pay for party primaries, appropriated $4 million in new spending and passed an unfunded property-tax cut aimed at St. John, during its April 4 session, despite the government’s budget shortfall and inability to pay basic bills. The property tax cut, sponsored by Sen. Tregenza Roach (I-STT) would give St. Johnians a special property tax credit, and homeowners throughout the territory an income-based property tax credit. 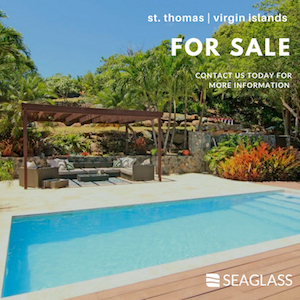 St. John has seen sharper increases in property values, as wealthy individuals have moved to the sparsely populated island that is mostly a national park, driving up prices. Unless or until the territory passes a constitution creating special municipal districts, it cannot legally have different rates on different islands. As a result, less wealthy St. John property owners have been hit hard by the tax increases and efforts to address the differential have been ineffective to date. Roach’s bill does not actually mention St. John. Instead, it tries to use the fact that most of the island is a national park owned by the federal government. It directs the territorial tax assessor to “determine the percentage of real property the federal government owns on each island at the time the assessment of residential real property” and use that percentage to determine a tax credit. It does not say what the credit will ultimately be, apparently leaving that up to the tax assessor, by a literal reading of the text of the bill. It does limit the credit to properties worth no more than $750,000. It also creates an enhanced homestead tax credit “equal to the amount by which the real property taxes calculated for the property for the prior years exceed two percent of gross household income.” The actual amount of the credit is capped at $5,000 and is applied to each homeowner on a sliding scale based on the value of property. It peaks at 90 percent of the income-based credit for property valued at up to $400,000 and gradually drops to 50 percent for property worth up to $750,000 and does not apply above that value. To qualify, homeowners must have incomes less than $75,000 for an individual or $150,000 for a family. While sure to be popular, the measure also would cut property tax revenues at a time when the V.I. government is already unable to pay all of its current bills. An increase in the base property tax rate to offset the loss is not a part of the bill. Sen. Jean Forde proposed one measure, approved on the floor without testimony or committee hearings, to mandate the Legislature fund primary elections. Forde’s verbal description said the measure “reprogrammed” $125,000 out of the Office of Election’s existing funding for this year to fund the primary. If that is correct, it would mean there is no new funding, just a mandate for the Elections Office to absorb the cost. The measure was approved by the Democratic Party majority in the Legislature. In practice, the measure primarily benefits the Democratic Party because it is the only party that routinely fields enough candidates to require a primary. The measure also extends the time for candidates to file nomination papers. Whether that would apply to the current year is unclear. May 8 is the last day to file this year. While approved by the Legislature this week, the measure is not yet law. It also removes a restriction on electioneering within 200 feet of a polling place that was enacted in 2016 in response to complaints from voters about loud and raucous partisans making it unpleasant. Others enjoy the lively atmosphere of V.I. elections, several senators pointed out. The senators also approved an appropriation of $3.5 million from the St. Croix Capital Improvement Fund, ostensibly to pay for dredging in the Schooner Bay Channel, adjacent to Gallows Bay on St. Croix. 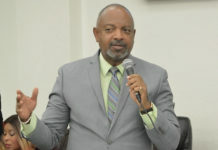 Sen. Novelle Francis (D-STX) said the dredging would allow small cruise ships to dock by Christiansted, expanding the island’s capacity to serve the cruise industry and bring in day visitors. Another measure from Sen. Neville James (D-STX) purports to appropriate $500,000 from that same fund to pay for “energy efficient retrofitting of the industrial park on St. Croix. James, Francis and Sen. Sammuel Sanes (D-STX) said the funding was for a “micro-grid” to power the industrial park, although the bill only says “energy efficient” and does not mention the creation of a grid or installation of alternative energy sources. The St. Croix Capital Improvement Fund has in recent years received appropriations from the Internal Revenue Matching fund of $2,000,000 per year. As of May 11, 2017 the unaudited budgeted balance in the fund was listed at $2.18 million. If another $2 million is added to that for the current year, on paper there is $4 million in the fund. But the territory is facing a terrible budget shortfall. It is more than $40 million behind in its current, statutorily mandated contributions to the Government Employee Pension System. Until the last week, the company running the territory’s sewage treatment plants had not been paid in more than a year and a half and was threatening to stop running the plants. Trash was piling up at some collection centers due to nonpayment of waste haulers. The government is tens of millions of dollars behind in paying its utility bills. The territory is unable to borrow in the private marketplace. It applied for $250 million in federal disaster assistance loans but has only received $85 million to date. Due to the budgetary uncertainty, the Legislature recently punted on the FY 2018 budget, leaving in place the FY 2017 appropriation levels. Since revenues are projected to be considerably lower than those appropriation levels, that effectively leaves it up to Gov. Kenneth Mapp’s financial team to decide how much to allocate to what expenses, with those levels functioning as caps or maximum amounts. The Legislature also approved a measure mandating the government hire a professional curator to manage millions of dollars in artwork and antiquities at Government House on St. Thomas. The measure, sponsored by Senate President Myron Jackson, also creates a new committee to oversee the curating of those artifacts. While Jackson proposed the measure in 2016, it became more urgent after the hurricanes when it was discovered that the Government House building on St. Thomas lay unlocked and moldering for several months. The V.I. Government has assured media and senators that the art, including multi-million dollar paintings by Pissaro, is secure. But it refuses to let media see or know where the objects are being held or provide a list of the artifacts. The Mapp administration testified against the measure when it was heard in committee. Government House Chief of Protocol Lisa Webster-Potter said many of the duties that the bill assigns to a curator are already part of the mandate of the territory’s State Historic Preservation Office and the small size of the collection would leave a curator without daily duties. The bill contains no funds to hire the curator. The above measures were approved with support from all 10 members of the governing majority. All 15 senators were present for the votes. also, lots of the grants that’s being announced from the Federal Government are technically matching grants. when the Senators reduce our revenues they’re also reducing our ability to match those funds.